It was evident already by midnight of the election day that Almazbek Atambaev was gaining an upper hand. Why did that happen and what does that imply? The country is easily divided into two regional parts – the South and the North, each having an even number of voters. Basically each and every political activity of the last few years has to deal with the opposition between the North and the South. In the recent election, the North has been represented by Atambaev, while the southern votes shared by former high official Adahan Madumarov and Kamchibek Tashiev, the head of the “Ata-Jurt” faction in the parliament. Atambaev’s victory has been secured by an unprecedented turnout of voters in the northern parts of the country that was, in its turn, conditioned by behavior of the southern candidates, threatening to “bring Bakiev back”. While Adahan Madumarov and Kamchibek Tashiev have shared and diluted the votes in the south, Almazbek Atambaev has managed to consolidate the northern elite and produce an overwhelming result. By making quite simple tactical steps, Atambaev has created a situation in which his principal rivals capable of “stealing’ the votes in the north have at different stages withdrawn and therefore worked for his sake. Meanwhile, remaining candidates in opposition to Almazbek Atambaev have gathered a press conference even before the final count of votes and made a number of claims of the alleged violations (presenting no solid evidence, though) thus acknowledging their complete defeat. The acting president of the country Roza Otunbayeva has made everything possible in order to dismiss the candidates that have built their platforms up on the criticism of the Interim provisional government. Slinging mud at Roza Otunbayeva, neither Adahan Madumarov nor Kamchibek Tashiev has been able to correctly estimate the iron will of this lady that has let her through the two tragedies of April and June 2010. Let us not forget that Roza Otunbayeva still enjoys the enormous support across the country as the only country’s leader in its history who has not been involved in any corrupt scandals. 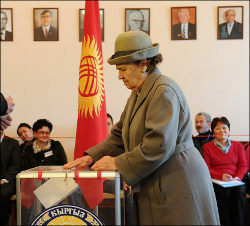 All those who support Roza Otunbayeva have actually cast their votes for Almazbek Atambaev too. All the “king’s men” have been deployed and engaged in support of the Almazbek Atambaev’s campaign by, inter alia, covering the local and international media. An amazingly positive and “shiny” coverage of the campaign by the local and foreign media should also be credited to Otunbayeva. One can easily predict praises on the part of international observers to be made first thing in the morning of October 31. Indeed, the biggest credit should be given to Roza Otunbayeva who has in the last year and a half visited a great deal of countries meeting countless international missions and delegations, while presenting Almazbek Atambaev as the follower of the democratic path. Opposition candidates have wrongfully built their campaigns upon the promises to investigate the April and June tragedies, threatening to revise the current policies, threatening to bring people out in the streets again. Quite unexpectedly, they have mobilized the part of the electorate that historically ignores any election, including progressive youth, the so called “middle class” and all those who value the relative stability over a new “adjustment”. One may recall that from the day one the parliament has been rightly criticized for its more that strange deeds, including sheep slaughtering in a ritual of animal sacrifice inside the House of the parliament, fights and scandals, or a week-long tour of forty deputies across some exotic countries using an official plane with no official reason. The Ata-Jurt party and especially its southern part has showed itself in a particularly arrogant and impudent way, thus entailing an expected frustration and irritation on the part of the population. This is the only reasonable justification for a strategic step by Roza Otunbayeva who has “ushered” the Ata-Jurt into the parliament last year. Last summer, in a surge of struggle over the CEC, Roza Otunbayeva has attempted to appoint “her man” Akylbek Sariev as the CEC chairman. However, the parliament dominated by the southern faction of Ata-Jurt, has elected T. Abdraimov, who represents a party in opposition. In this situation, the results of the election to be announced by the CEC, led by a representative of the opposition T. Abdraimov should discard any allegations of the administrative pressure. After the expiration of Roza Otunbayeva’s term as the president, Almazbek Atambaev will have to give away a number of high official posts to his huge staff and numerous supporters. Most likely, he is going to dismiss a number of officials in areas where he lost votes to Madumarov and Tashiev, primarily in the south of the country. That would accumulate the protest potential in the south, similarly to the situation before March 2005, when the revolution against Akaev had actually originated in Jalal-Abad and in Osh. This, in turn, increases the likelihood of the obvious division between the south and the north, with no chance to “let the steam out” for the loser candidates. That means that the people who cast their votes for Madumarov and Tashiev (around 30%) and frustrated over Atambaev’s victory are going to accumulate the subdued frustration for the future protests in the most convenient moment.